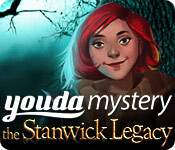 Uncover your grandfatherвЂ™s secret in Youda Mystery: The Stanwick Legacy, an incredible Hidden Object Puzzle Adventure game! After inheriting Stanwick Manor, Emma searches the house and discovers that there is a secret to reveal. Finding proof that the house isnвЂ™t as abandoned as she was led to believe, Emma must now solve clever puzzles and make her way into locked rooms to discover the truth behind the mansion in Youda Mystery: The Stanwick Legacy!